Sportscaster, actress, First Lady of Kentucky from 1979 to 1983. 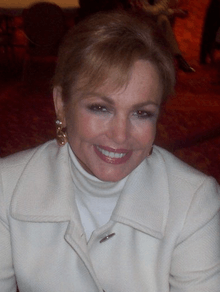 Phyllis Ann George Brown (born June 25, 1949), Miss America 1971 and Miss Texas 1970, is an American businesswoman, actress, and former sportscaster. She was also First Lady of Kentucky from 1979 to 1983. George was born to Diantha Cogdell and James George in Denton, Texas. She attended the University of North Texas for three years until crowned Miss Texas in 1971. At that time, Texas Christian University awarded scholarships to Miss Texas honorees. As a result, Phyllis left UNT and enrolled at TCU for several weeks until winning the Miss America crown later that fall. She is a member of Zeta Tau Alpha sorority. George was Miss Texas 1970 and was later crowned Miss America 1971 on September 12, 1970. The Women's Liberation Front demonstrated at the event. In August 1971, George traveled to Vietnam with Miss Iowa Cheryl Browne, Miss Nevada 1970, Vicky Jo Todd, Miss New Jersey 1970, Hela Yungst, Miss Arizona 1970, Karen Shields, Miss Arkansas 1970, Donna Connelly, and George's replacement after she was crowned Miss America, Miss Texas 1970, Belinda Myrick. They participated in a 22-day United Service Organizations tour for American troops there. The tour began in Saigon. Browne later commented that she thought "it was one of the last Miss America groups to go to Vietnam." During her year-long stint as Miss America, George also appeared on numerous talk shows, including three interviews on The Tonight Show Starring Johnny Carson. CBS Sports producers approached George to become a sportscaster in 1974. The following year, she joined the cast of The NFL Today, co-hosting live pregame shows before National Football League games. She was one of the first females to have a nationally prominent role in television sports coverage. Another duty George had with CBS Sports was working on horse racing events, including the Preakness Stakes and the Belmont Stakes. Additionally, George had a brief stint on a television news version of People in 1978 and a job as a morning television talk show host as co-anchor of the CBS Morning News in 1985. Since that time, she has sporadically returned to the media spotlight, hosting her own prime-time talk show, 1994's A Phyllis George Special, on which she interviewed then-President Bill Clinton, and a 1998 talk show called Women's Day on the cable network PAX. George also appeared as a guest star on The Muppet Show in 1979. In 1985, CBS settled on Phyllis George to serve as a permanent anchor for its morning news program. George was given a three-year contract following a two-week trial run. As co-anchor, she interviewed newsmakers including then–First Lady Nancy Reagan. George has founded two companies in her business career, the first of which was "By George" chicken fillets. In 1988 after operating for only two years, George sold the company to consumer giant Hormel Foods, which agreed to operate it as a separate division. In 1991, George received the "Celebrity Women Business Owner of the Year" from the National Association of Women Business Owners. In 2003, she created Phyllis George Beauty, which markets a line of cosmetics and skincare products through television shopping network HSN. She has also written or co-authored five books—three about crafts, one on dieting (her first book, The I Love America Diet, published in 1982), and her most recent, Never Say Never (2002). George was previously married to Hollywood producer Robert Evans and to former Kentucky Governor John Y. Brown, Jr., serving as Kentucky's First Lady during Brown's term in office. During her marriage to Brown, she had two children, Lincoln Tyler George Brown and television reporter Pamela Ashley Brown. George was the founder of the Kentucky Museum of Art and Craft, and is an avid folk and traditional arts collector. She is also a founding member of the Henry Clay Center for Statesmanship. George resurfaced in 2000 when she played a minor character in the hit movie Meet the Parents. It was one of her very few film roles. On January 28, 2007, reporter Howard Fineman said on The Chris Matthews Show that George had moved back to Kentucky and was considering entering politics with either a run for governor in 2007 or a Senate race against Senate Minority Leader Mitch McConnell in 2008. Neither event occurred. George's stepson John Young Brown III served as Kentucky's secretary of state from 1996-2004 and ran unsuccessfully for lieutenant governor in 2007. On October 3, 2009, Verne Lundquist of CBS Sports said during the broadcast of the LSU at Georgia football game that George had moved to Athens, Georgia. ↑ "Texas Birth Index, 1903-1997". Ancestry.com. Retrieved November 28, 2010. 1 2 "The Thrills and Trials of Being Miss America". Herald-Journal. 1971-08-08. Retrieved 2010-02-20. ↑ Cauley, Paul (1971). "Photographs by Paul Cauley, 1971 Door Gunner, A Co 101st Avn (Text by Belinda Myrick-Barnett)". Paul Cauley. 1 2 Davis, Shirley (2000-10-19). "History follows former Miss Iowa First black pageant winner recalls her crowning moment". Quad-City Times. ↑ Perlmutter, Marty (1975-12-05). "Phyllis George Finds Her Career". The Palm Beach Post. Retrieved 2010-02-20. ↑ "Gardner Set For High-Visibility Role". Toledo Blade. Dallas Morning News. 1987-12-26. Retrieved 2010-02-20. ↑ "Miss America takes back seat to horses". Beaver County Times. United Press International. 1975-06-07. Retrieved 2010-02-20. ↑ Thomas, Bob (1978-09-16). "Phyllis George wanted more than being female jock". Eugene Register-Guard. Associated Press. Retrieved 2010-02-20. ↑ "Phyllis George Quits". Eugene Register-Guard. Associated Press. 1985-08-31. Retrieved 2010-02-20. ↑ "Phyllis George enjoys first day as co-anchor". Milwaukee Sentinel. 1985-01-15. p. 3. ↑ "George sells chicken". Sarasota Herald-Tribune. 1988-08-20. p. 2AS. ↑ Associated Press (1991-07-23). "From a queen to a company boss". St. Petersburg Times. p. E1. ↑ "Chatting with Phyllis George". Fort Worth Star-Telegram. 2004-12-05. p. 3G. ↑ "Ex-Miss America Eyes Politics". New York Post. 2007-01-31. ↑ "There she was and she was so nice". Fort Worth Star-Telegram. 2002-10-11. p. 6 Life & Arts. ↑ "Phyllis George Seeks Divorce". The Dispatch. Associated Press. 1978-04-03. Retrieved 2010-02-20. ↑ "Phyllis George seeks divorce from Brown". Ocala Star-Banner. 1997-12-09. Retrieved 2010-02-20. ↑ "The Reliable Source". The Washington Post. 2007-03-29. ↑ "Appalachian Artisan Center's first Spring Celebration". Hazard Herald. 2007-05-23. ↑ "Phyllis Meets The Parent". New York Daily News. 2000-11-20. ↑ "Ex-Miss America Eyes Politics". New York Post – Liz Smith. 2007-01-31. One to One with Bill Goodman: Phyllis George - interview with Phyllis George on Kentucky Educational Television network, June 8, 2008.